Commercial properties can be a good investment opportunity. For your money, commercial properties typically offer more financial reward than residential properties, such as rental apartments or single-family homes. Obtaining a large sum of capital in commercial real estate investing is much easier as there are many financing options to choose from. As a commercial real estate investor, not only do you have the ability to raise capital by using traditional financing options, but you can also use the help of hedge funds, investment groups, and private equity firms. Commercial property investors can also pool capital and have access to more financing to purchase the investment property. Commercial properties generally have an annual return off the purchase price between 6% and 12%, depending on the area, which is a much higher range than typically exists for single family home properties (1% to 4% at best). It's often easier to evaluate the property prices of commercial property because you can request the current owner’s income statement and determine what the price should be based on that. If the seller is using a knowledgeable broker, the asking price should be set at a price where an investor can earn the area’s prevailing cap rate for the commercial property type they are looking at (retail, office, industrial, etc.). Residential properties are often subject to more emotional pricing. When investors place “positive leverage” on an asset, they effectively multiply their net spendable cash by borrowing money at a lower cost than their property returns back to them. A quick example: your friend loans you $10 and asks for $11 back, one dollar interest….you immediately loan that $10 to someone else and ask for $2 interest…paying back the $11 owed and making a profit with no additional investment…you just participated in positive leverage. There are variations to triple net leases, but the general concept is that you as the property owner do not have to pay any expenses on the property (as would be the case with residential real estate). The lessee handles all property expenses directly, including real estate taxes. The only expense you’ll have to pay is your mortgage. Companies like Walgreens, CVS, and Starbucks typically sign these types of leases, as they want to maintain a look and feel in keeping with their brand, so they manage those costs, and you as an investor get to have one of the lowest maintenance income producers for your money. Strip malls have a variety of net leases and triple nets are not usually done with smaller businesses, but these lease types are optimal and you can’t get them with residential properties. Roatan and its neighboring Bay Islands are among the most beautiful destinations in the all the Caribbean. These lush, tropical islands enjoy extremely comfortable year-round temperatures, averaging 27°C (80°F), and boast of white-sand beaches, lush landscapes, exceptional water sports, a great standard of living, and friendly locals. There is so much that awaits to be discovered in Roatan so come and let us show you around! The islands remain among the most affordable Caribbean islands in terms of real estate and quality of living. We know that after just one visit Roatan and they Bay Islands will become one of your favorite places in this world too! 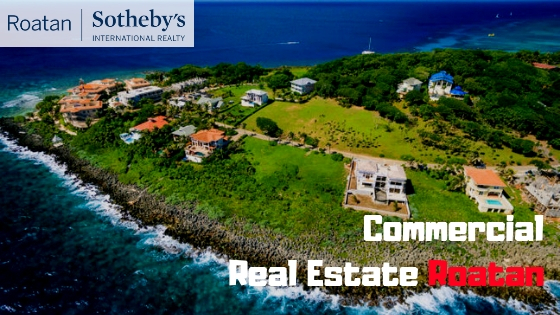 Roatan Sotheby’sInternational Realty (SIR) was founded in 2017 to clients a unique level of service that can’t be found elsewhere on the island. For the first time, our sellers will be given the opportunity to leverage the global reach of the Sotheby’s International Realty brand to deliver an unmatched level of results. Roatan SIR will also offer our buyers unrivaled expertise on the local real estate market combined with access to the island’s most exclusive listings and unparalleled customer service. In short, our focus is both local and global, and it is a proven approach to generate results.